Have you ever wondered how many companies are there in India? If you provide loan to Companies, sell them services or are involved in industry analysis, then this question must have occurred to you. Perhaps you know the answer too. As of June 2015, there were nearly 14 lacs companies in the country. Of these, nearly 10.5 lac companies are currently active and the rest are either dormant or closed due to several reasons. The team at Tofler (a corporate database with information on all Indian companies) has prepared a heat map of active Indian companies. This heat map locates the active companies across India on its map and shows the density of companies in different geographies. It gives a very clear idea of extant of commercial and economic activity in various geographies across the country. This can also help you strategise your business development and sales efforts. It is apparent from the above heat map that the largest number of active companies is located in Maharashtra, Delhi and West Bengal. Of the 15 lac companies in India, Maharashtra and Delhi hosts nearly 2 lac companies each. Infact, Maharashtra, Delhi and West Bengal alone host nearly 54% of all the active companies in India. On the other side, the North-Eastern states and Jammu & Kashmir host the least number of companies. Only approx.. 0.6% of all Indian companies are located in these states. 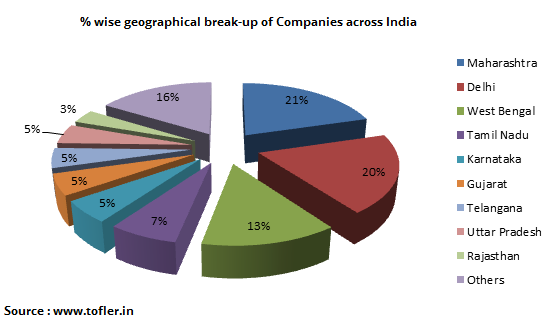 The following chart gives a %age wise break-up of the location of the companies across India. Clearly around 80% of the companies are based out of only 8 states/ union territories in India. Geographically, this is a very big bias. We will follow up soon with detailed insights on state and city level as well. Author – Vishal, a recent addition to Team Tofler, combines his passion of writing with searching for a worthy story in the business and financial landscape of India, to make an interesting read.